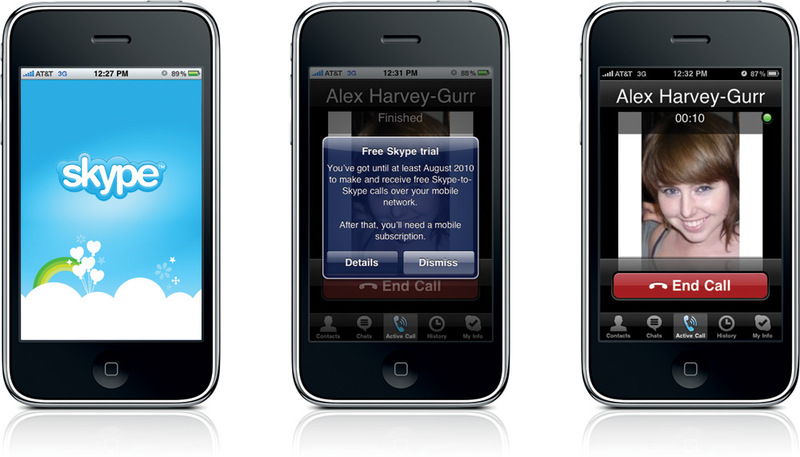 Today Skype officially released version 2.0 of its iPhone app which now supports voice calling over AT&T’s 3G network. iPhone users with the updated app will, for the first time, be able to place and receive Skype to mobile and landline calls both domestically and internationally at low rates over 3G instead of being limited to just WiFi networks. The new version will be compatible with the iPhone, iPhone 3G, and iPhone 3GS, as well as the iPod touch (with a compatible headset) and the iPad. This comes only days after Skatter Tech first broke the news that Skype will soon be coming to Android devices this year and two months after Skype first announced its partnership with Verizon Wireless, the first cell carrier to allow Skype-to-Skype calls over 3G. iPhone Skype-to-Skype calling over 3G will be free until the trial period concludes at the end of 2010. After this trial period ends, users will be required to have a paid monthly mobile subscription, even if they are already Skype Out customers. Although Skype has yet to release details on how much these charges will be, it’s likely that prices will remain low in conjunction with Skype’s history of affordable calling rates. iPhone owners who were already using Skype at WiFi hotspots will be pleased to know that Skype-to-Skype calls using WiFi will continue to remain free. This is very exciting news for Skype fans who are on AT&T, as they will now be finally able to call both Skype users as well as traditional phone lines over 3G without eating into their minutes. Until today, AT&T users were limited to using Skype over WiFi and were left with a warning when attempting to place calls on 3G. Skype 2.0 also gives AT&T a competitive edge over Verizon, which does not allow its customers to place domestic Skype-to-Phone calls without knocking minutes off of their standard cellular calling plan. While Verizon customers are limited to just Skype-to-Skype calling and discounted international rates on 3G, iPhone users have the option to do both. This could potentially push a few more consumers towards AT&T instead of Verizon, which has been destroying AT&T in terms of service and reliability. Apple stands to benefit from this as well, especially since they are trying everything possible to regain better sales figures after Android devices overtook iPhone numbers last month. Having some openess by allowing VoIP Skype calls could potentially help bring numbers back up for both AT&T and Apple. For those wanting to take the newly updated app for a test drive, it’s available as a free download through the Apple App Store. Update 6/2/2010: Skype has extended 3G calling through the end of 2010. They will no longer begin charging users starting in August as originally intended.